Peer review, the process by which subject experts evaluate a piece of work, is an integral part of scholarly publishing. In most cases peer review is coordinated by an editor at a scholarly journal and is performed privately amongst two to three peers. There is no standard report that peer reviewers complete, however, they are generally asked to make a decision if the paper is acceptable for publication or not based on the merits of the paper. The traditional process of peer review while widely regarded as being crucial in scholarly publishing has become increasingly criticized for its shortcomings. Strikingly, tests on the veracity of peer review have shown that most major errors are not detected during peer review (Smith 2010, Godlee, Gale, and Martyn 1998, Baxt et al. 1998). These findings have called for new ways of improving peer review to be explored. One suggestion is to make peer review more transparent (i.e. the contents can be read by the public) and for it to occur post-publication (Smith 2010). Post-publication peer review is organized similarly to pre-publication peer review except that it occurs after a paper has been published or made public. Post-publication peer review has also been used to describe blogging, journal clubs, and other forms of review that occur on the Internet or in private. To better understand how researchers view traditional peer review versus open peer review, and other new forms of peer review we surveyed the scholarly community via an informal survey. We invited scholars to take part in our survey by invitation through Twitter and The Winnower emailing list. We acknowledge that our methods of recruitment may represent a biased population of researchers towards new models of publishing and scholarly communication, given The Winnower’s model of publication and review. We received seventy-nine responses over the course of a few weeks of solicitation. Of these seventy-nine, 70% (55) were faculty, librarian, or researcher, including early career researcher with the remainder made up of PhD students, Master students, and other, at 18% (14), 4% (3), and 8% (6) respectively. Those identifying as “other” in the survey included publishers, independent scholars, and retired professors. In agreement with this, 61% of respondents identified as being at University. Figure 1: Employment Level of 79 respondents. 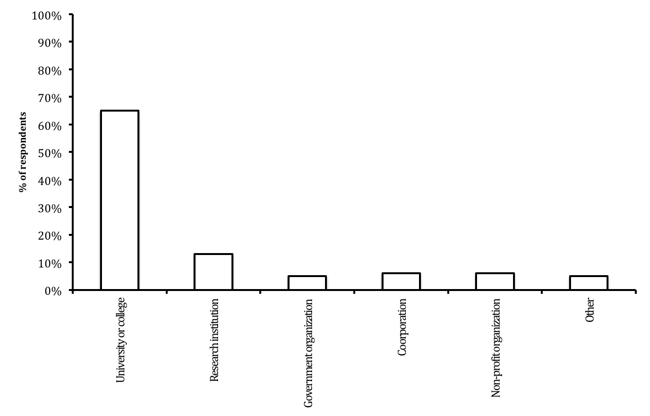 70% (55) were faculty, librarian, or researcher, including early career researcher. 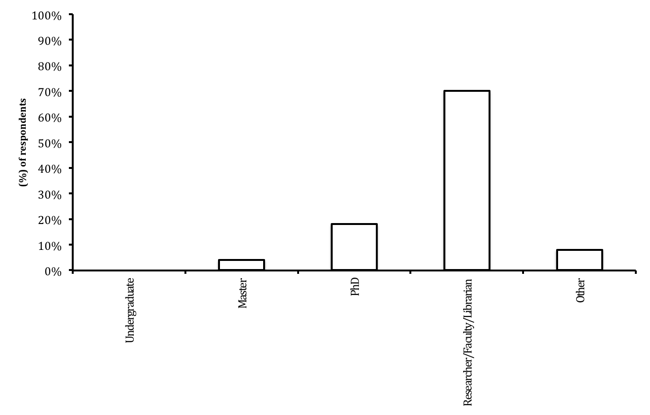 The remainder was made up of PhD students, Master students and other, 18% (14), 4% (3), and 8% (6) respectively. 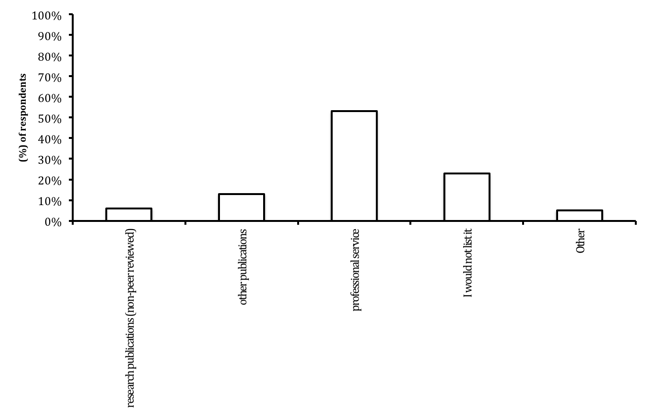 Figure 2: Employer/Organization of 79 respondents. The respondents polled came from a diverse background of study with Biology and the Life sciences making up the largest percentage of the group (Table 1). Most respondents had previously had their own work peer reviewed (92%) and had performed peer review of others work before (94%). In general the survey showed that most believe peer review was beneficial, both to give and to receive. While the merit of reviews was recognized amongst researchers the poll showed most believed that peer review did not aide greatly in the advancement of their career. (Table 2). Because peer reviews are currently private and thus hard to measure as an output by promotion and tenure committees and others, it is possible that open reviews may rectify this. Moreover, would making peer reviews open change the content or tone of them? When asked if peer reviews were made public, would they change? 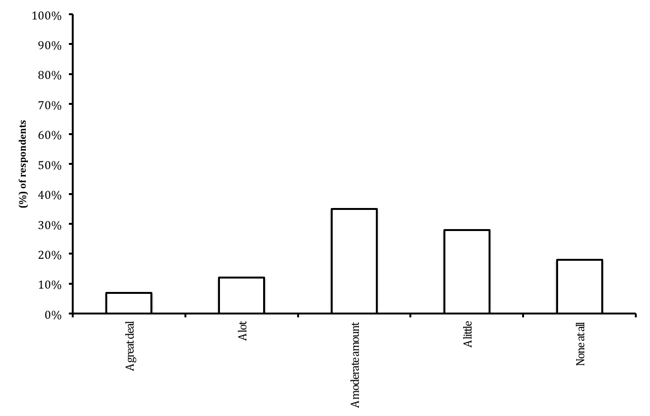 Most respondents answered yes, but to varying degrees (Figure 3). When asked how, many seemed to suggest that reviews may improve in various aspects from tone to better justification of critiques (see appendix). Figure 3. Do you think the review would have been different if it had been published for others to see? Figure 4. Assuming you wanted to: how much more time/effort do you think it would take to make your peer review something that could be posted publicly? Figure 5. 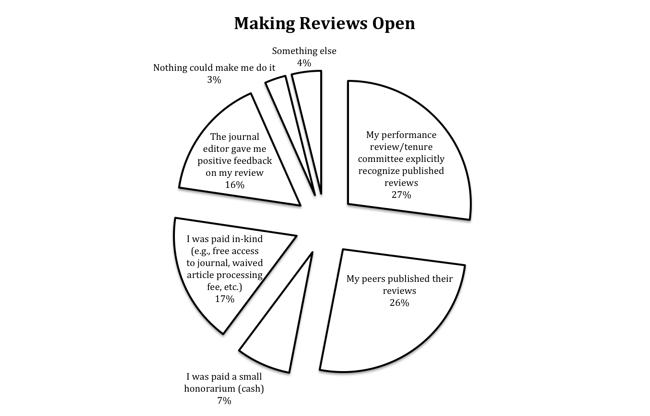 If published, researchers would largely consider reviews as professional service. Thus, based on our survey researchers see value in peer review, believe that open review would generally improve reviews, and that peer reviews should count for career advancement. However, most reviews remain private. When asked what change would need to happen for reviewers to make their reviews public, most said if tenure and promotion committees explicitly valued them and if their peers also published theirs (Figure 6). Figure 6. Reasons that would incentivize scholars to make their peer reviews publicly available. Respondents selected two reasons that would make them more likely to take the effort to make their reviews public. 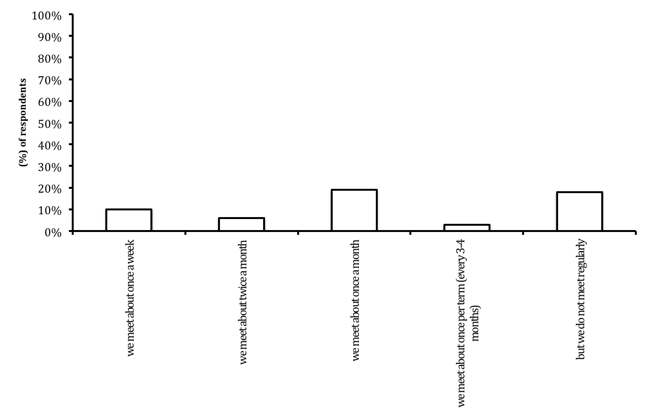 Given the value of openly reviewing work amongst peers, many labs participate in a semi-regular meeting called “journal club.” In our survey 56% of respondents participate in journal clubs at varying frequencies (Figure 7). 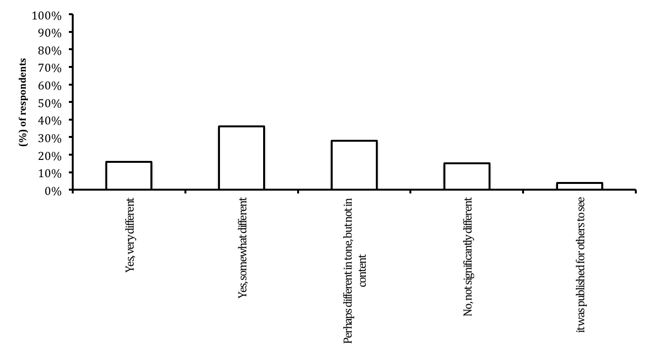 Although the majority of those we surveyed participate in journal clubs, the large majority of them do not publish them (67%). Again, when polled what would change this most pointed their promotion and tenure committees explicitly valuing them and their peers also publishing theirs (Figure 8). Figure 7. Do you or any of your peers participate in a "journal club" (meet informally to discuss published academic papers)? Figure 8. Reasons that would incentivize scholars to make their journal club discussions publicly available. Baxt, William G., Joseph F. Waeckerle, Jesse A. Berlin, and Michael L. Callaham. 1998.\n "Who Reviews the Reviewers? Feasibility of Using a Fictitious Manuscript to Evaluate Peer Reviewer Performance." Annals of Emergency Medicine no. 32 (3):310-317. doi: http://dx.doi.org/10.1016/S0196-0644(98)70006-X. Godlee, F., C. R. Gale, and C. N. Martyn. 1998. "Effect on the quality of peer review \nof blinding reviewers and asking them to sign their reports: A randomized controlled trial." JAMA no. 280 (3):237-240. doi: 10.1001/jama.280.3.237. Smith, R. 2010. "Classical peer review: an empty gun." Breast Cancer Res no. 12 Suppl \n4:S13. doi: 10.1186/bcr2742. "the review makes the work recoverable improving the content and scientific critics are very important!" “If you want a study run a certain way, write your own paper." "1. reviewers would be hesitant to use trashy or insulting remarks - kindness matter and when your name is attached to your trashy report, that is not a cool thing. 3. reviewers would be constructive; after all that is really cool and what I would expect from myself as a reviewer"
I aggree with Jonathan that it should be more emphasized that there are "only" 79 total responses and there should be a concluding section. Additionally, maybe you can improve the Figures a little bit: I find the description of the groups on the x-axes hard to read - maybe use patterns and/or colors and a legend instead? Also, how about adding the exact value at the top of the corresponding bar? How about scaling not every figure to 100% on the y-axis but instead to the corresponding maximum? Is there a reason why Figure 6 is a pie chart? My suggestion is to use a horizontal bar diagram for everything, so that the bars go from left to right. This way you can easily write the description into the bar (or to the right of it). I think that would be much easier to read and compare! Another little idea: You have this nice Table 1 with all these areas. It would be maybe nice to group them together in 3 or 4 larger groups (e.g. Nature science, Humanities, Others...) and then see for certain questions the differences. Of course, since n=79 is a relatively small sample set, generalization is difficult, but maybe it gives some indication? This might also be an option if you have a larger sample set. This is an interesting and novel contribution looking researchers’ opinions about peer review, particularly regarding open peer review and other potential innovations. 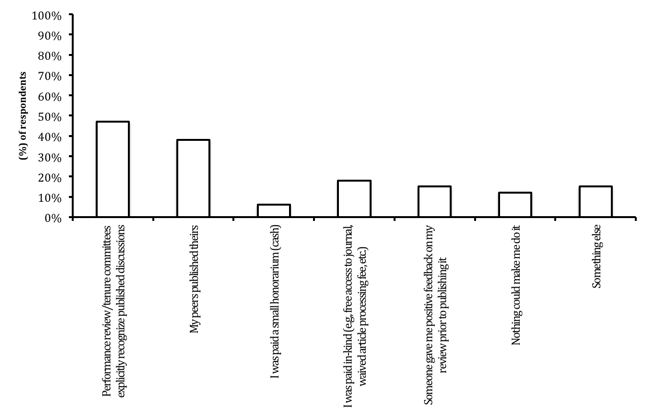 An anonymous online survey was conducted asking about various aspects of peer review. The paper reports the results. One interesting finding is the importance of a scholar’s peers publishing their reviews, and the promotion/tenure committee valuing published reviews, in determining reviewers’ likelihood of making their reviews open. At the outset it’s worth noting that there were 79 total responses, which is really my only concern about the results. This seems small for a survey, particularly given the heterogeneity of the respondents, and makes me wonder about how the findings would generalize to a larger sample. I was surprised to see that most people did not think reviews counted towards career advancement. I agree with this, but always have the sense that one reason junior scholars perform review is a perceived career benefit. Juxtaposed to this is that most of the respondents thought peer review should count more towards career advancement. One thing that would have been nice would have been to make the specific questions, and the data/analysis, publicly available. For example, using Open Science Framework (http://osf.io) or GitHub. See also http://centerforopenscience.org/top/. If this is not possible, it would be nice to include the reason why in the paper so it becomes part of the scientific record. I found the paper well-written and easy to read. I would have appreciated a short conclusions section to tie together some main themes from all of the results (8 figures worth). All in all I found this to be a useful survey. I would be interested to see a version with a larger number of respondents, which might also allow for looking at differences across career stage, discipline, etc.